Pencu lived a happy life with his wife Lhamo and their sons Dorji, Renchin, and Gama in a big tent near a river. Lhamo worked at home, milking and collecting yak dung for fuel. Every morning Pencu took the livestock to the mountain. Dorji, Renchin, and Gama did much housework and helped their mother fetch water. Twenty years passed. Pencu and Lhamo got older. One by one the sons left their parents’ home and each established his own tent. Now, Pencu and Lhamo’s led simple lives in their old tent and only had two sheep left after they gave their other livestock to their sons. Now they had only simple food. Pencu did as he was told, but he was treated unkindly by each of them during his stay at their homes. Three months later Tsomu came to visit again. She learned what had happened and was saddened by what she heard. She whispered something to Pencu and then returned home. The next day Pencu got up early and told Renchin that he would go to Lhasa. “Many years ago I loaned one thousand yuan [dollars] to a man in Lhasa. Now that I have some more time left, so I’ll go to Lhasa for a little while and see what I can get back with from there,” he said. He mounted a horse and rode away. Some days later he came back. His sons smiled when they saw him return and helped him get off his horse. They had noticed that Pencu was holding a chest, and thought it contained the money. “Father, did you get the money?” Renchin asked softly. Pencu said nothing. He sat down on the grassland. His three sons sat around him. Pencu did not feel angry. He felt sorry for his son. Renchin went on, “Please come and stay in my tent as long as you wish. I’ll be kind to you.” Renchin helped Pencu stand up and they walked together to Renchin’s tent. Pencu entered the warm tent with his sons. That night Pencu was happy. He had mutton to eat, drank milk tea, and talked with his sons all night. All his sons were very kind to him because they were thinking of the locked chest. They were eager to inherit the money they thought was in it. When Pencu died, his sons were not all too sad. They took the heavy chest, looked at each other and smiled. 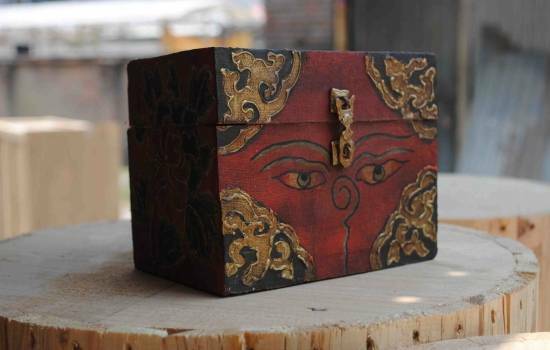 Renchin opened the chest. It was full of stones. They took the stones out of the chest and found there was no money inside it. They looked at their dead father and shouted angrily at him. Tsomu heard them from her tent. She knew what had happened and laughed.